The credit union industry is leading the way with green initiatives, from small shops to the NCUA. 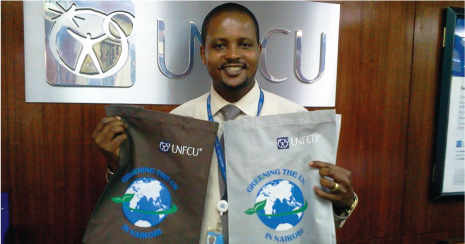 Donald Mwangi, a member service representative at United Nations FCU in Nairobi, Kenya, displays Green Bags that are being sold to benefit local environmental efforts. During the past decade, the credit union industry has embraced the importance of corporate social responsibility and launched a myriad of initiatives to enhance sustainability.